Howdy and welcome back to Flawed yet Functional! 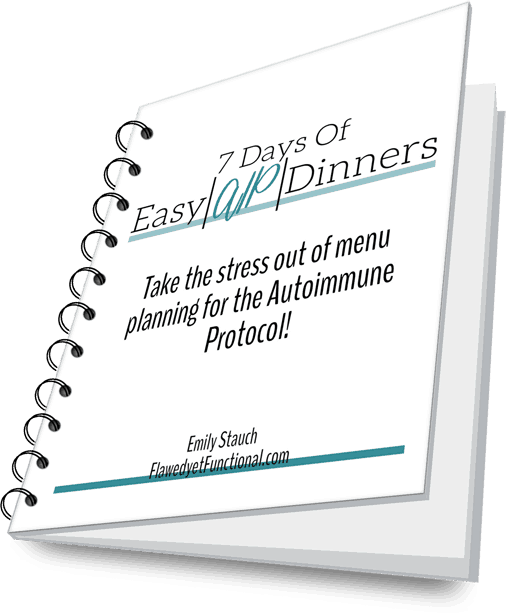 My journey through the Autoimmune Protocol as a Type 1 Diabetic has had it’s ups and downs. One of the eliminations right from the get go is caffeine. Ah, the agony! Do you feel it too? My coffee? My hot cinnamon spice tea? Will life go on??? Well, there’s one thing I’ve learned going through the AIP elimination and reintroduction phases: there’s always something else to enjoy. I’ve found I love tea, even non-caffeinated herbal tea. Let me show you how to make great herbal tea, because after all, there is a right and a wrong way! Caffeinated tea was one of my first reintroductions after my initial AIP elimination phase in February 2018. But wait, did I even eliminate it completely? I’m actually not sure now that I look through my notes! As you know, I love my cup of hot tea in the morning while I journal and spend time with Jesus. During the crack-down to regulate my blood sugar in late November/early December, I gave up caffeine again. Drinking herbal tea was already a nightly ritual for my husband and me, but drinking it in the morning and throughout the day was new. It wasn’t bad either! I, of course, had a 2 day caffeine headache which wasn’t fun to go through, but after that, I’ve felt great. Ok, enough about me and caffeine! Let’s talk about how to make great herbal tea. The water you use to make your tea will have an impact on the taste of the final product. The filtered water from a refrigerator tastes cleaner and brighter than water from the tap, and it is noticeable in the tea. Always start with filtered water. Also begin with fresh water, meaning dump any water in the kettle that had already been boiled. Boiling and re-boiling water will dull the flavor of the tea. Start with fresh, filtered water with every pot of tea. Vibrant, full-bodied tea comes from brewing using loose leaf tea. Don’t worry though this is not more expensive than tea bags (well, actually it is if you’re buying store brand tea, but not if you’re buying loose leaf from that uber expensive mall chain store!). The temperature of the water matters for a great cup of tea. It is possible to burn the tea leaves! For herbal teas, boiling water is used, 212°. Although, I’ve read many place that just under a boil is fine too for herbal teas. I’m going to head off into tea snob land here for a bit. When I drink tea, or coffee back in the day, I want every cup to be awesome every time. To accomplish this, weigh the water and time the brew every time. Weigh the water? Yes, that’s what I said, for 1 tablespoon of herbal tea leaves, I use 29 ounces of water (820 grams). Why 29 per 1 tablespoon? Experimentation. Begin with 1 teaspoon of tea for 8 ounces of water and adjust more or less to your liking. The 29 ounces/1 tablespoon ratio give my husband and I each one large cup of tea in our respective thermos/mug. Once you figure out your personal ratio, lather rinse repeat every time for a great cup of tea! You must, must, must time the brewing of your tea. If you are anything like me, you’ll want to throw a load of laundry in the dryer and be “right back.” Inevitably, it’s 15 minutes before you return. The tea will be over steeped by that time, likely bitter and underwhelming if not downright awful. Take a few seconds to set a timer for 5 minutes that will chime loudly enough for you to hear. Remove the tea from the leaves immediately. That’s right, I don’t have a proper teapot, and I abhor those mesh balls that go in a tea cup. They shed tea leaves every time! The French press plus a kettle and kitchen scale will leave you a debris free, consistently delicious cup of tea every time. With herbal tea a large part of my life right now, I had to learn how to make a great cup of herbal tea. My hot drinks must be delicious and yours should be too! Enjoy and happy tea drinking! What are your favorite herbal teas? Have a favorite brand or blend you love? Do you have any other tea brewing tips I missed?